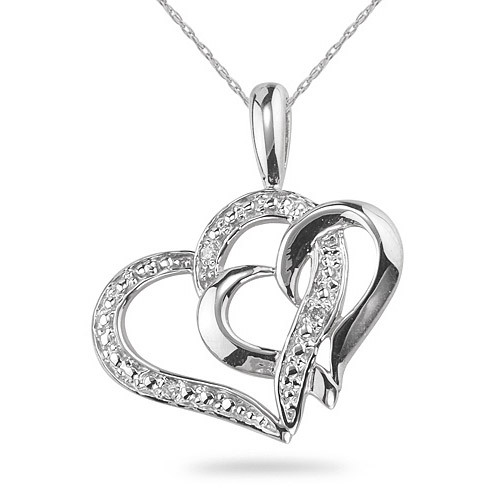 A 14k white gold heart is connected to a diamond heart also in 14k white gold to create this beautifully-made and unique diamond heart necklace from Apples of Gold Jewelry. The diamond necklace is set with 3 diamonds weighing 0.03 carats. 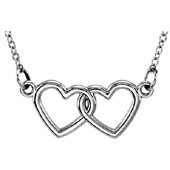 Rhodium accents make the necklace appear to have a splash of additional white diamonds in addition to the 3 diamonds set in the heart. This pendant is also available in 14k yellow gold, shown below. We guarantee our Heart Within a Heart Diamond Pendant, 14K White Gold to be high quality, authentic jewelry, as described above.